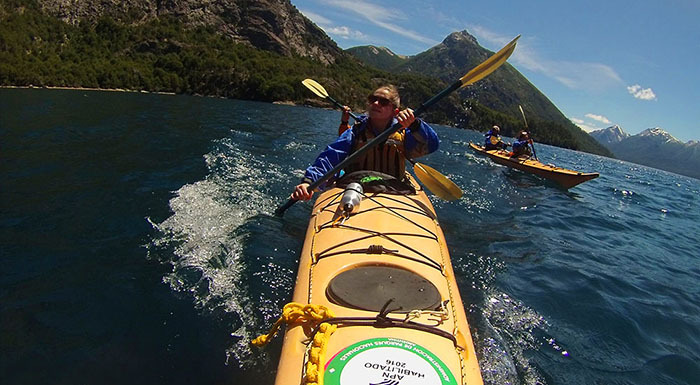 Paddling in Bariloche. Explore the beauty of Patagonia from the water, traveling silently across pristine bays. Enjoying the quietness and calm of the wilderness while you have lunch by the lake shore. Meet your local guide for a briefing on the day schedule while he or she explains the basics of kayak touring and the safety procedures on the water. 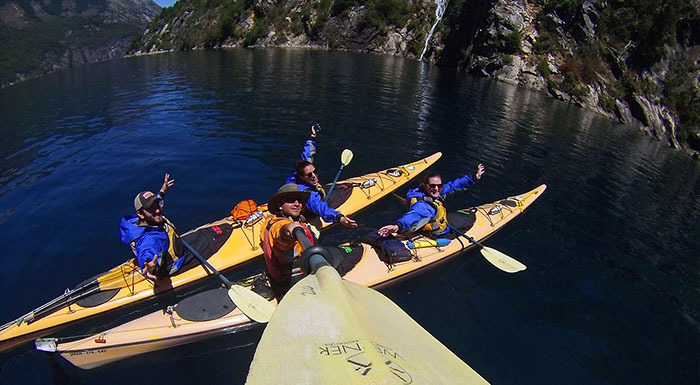 You will be kayaking on Lake Nahuel Huapi and Lake Moreno, getting to know their coasts and hidden bays where most people have no access. Comfortably seated on sea-kayaks you will have time to take pictures, explore and enjoy the landscape from this new perspective. If you are interested the guide will coach you paddling techniques and share his knowledge on Patagonia natural history. On an isolated beach you will have a delicious picnic lunch, relax and breathe fresh air surrounded by pure nature. After lunch continue the traverse gaining an amazing view of Tronador Mountain as if we would be staying the best suite of Llao LLao Hotel. Along the coast of the lake you will find a variety of trout’s and native birds which allow you to get surprisingly close on your kayak. On the way back to the hotel, it might be time to celebrate a beautiful adventure paddling in Patagonia with a localy brewed beer! Considerations: We adapt paddling routes according to the level of experience of participants. During early Spring, you will need a sunny and calm day so temperatures are not too cold to be on the water. This program is weather dependent since windy days may be too challenging for beginers.